This full-day tour from Toronto to Niagara Falls includes a wine tasting and free time to explore Niagara Falls and Niagara-on-the-Lake, plus you can choose to include a meal overlooking the falls and a in season attraction (Journey behind the falls, Niagara Fury or Imax Theatre) at an extra cost. Sit back, relax, and let your guide show you the magic of Niagara Falls. Continue to Niagara Falls to enjoy free time to experience this majestic site. 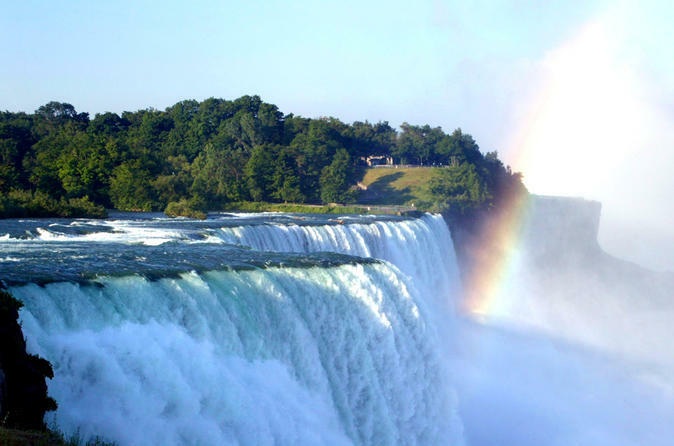 Your time here includes a trip on the Hornblower boats to see the majestic falls. You can also choose to experience the Journey Behind the Falls, take a helicopter tour over the falls, take a jet boat ride, check out the Butterfly Conservatory or Niagara Falls Aviary, or visit Clifton Hill or the Skylon Tower (all additional activities at own expense). You'll be dropped back off in Toronto.